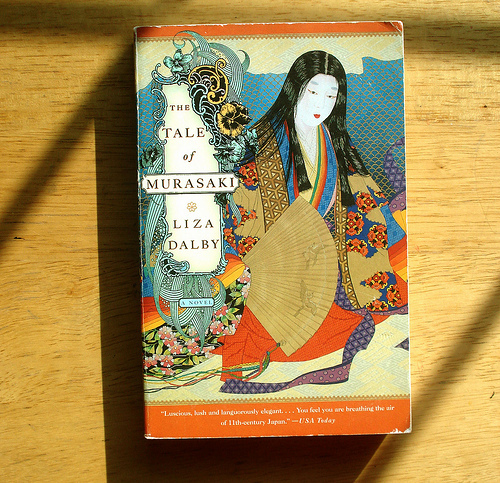 I’ve been reading The Tale of Murasaki by Liza Dalby for some time now. On some days I’ll sit and read 50 pages, others only 5, making the going overall rather slow. I’m about halfway through now, and having made an observation that I find interesting, decided to share it. This book is description-heavy. On every page there is some description of the surroundings, so much imagery that the book is like an overstuffed furniture piece of a story. Now, I’m not saying this is a bad thing. On the contrary – overstuffed furniture tends to be very comfortable – the kind you can sink into and not want to leave for hours. And, as the story is told from the point of view of a writer (and we tend to be observant people), the extreme level of imagery is not out of place. I only notice because it’s not common to have quite that much description. I recollect that even in other books that do seem to describe the scenery quite often, the author will give you enough to picture where the characters are and then move on. While seamlessly weaving in plot and dialogue among the bombardment of images, Liza Dalby seems, at times, to continuously remind you where Murasaki is. (Or, Murasaki constantly reminds you/herself of where she is.) It emphasizes Murasaki’s awareness of the world. I do think it’s brilliant, and the writing is so artful that it doesn’t get old – not to mention how beautiful a picture of Japan is created by the descriptions. It seems to me, as well, that it takes an extra dose of dedication to keep up such an approach throughout a 400-500 page book. Now, out of curiosity, I ask: Would you have noticed such a thing in reading this book? Would you have thought it important? Do you think that too many writers get sidetracked with descriptions? – Because I think that a lot of writers do get caught up in telling the reader exactly what a character or world looks like, before they give us cause to care. While description is a good writing excercise, I think it shouldn’t dominate the writing. If you don’t have the content to go along with it, all the pretty pictures in the world will not, in fact, make the story good. That is not to say that, sometimes, description can’t be an entire story. Flash fiction, at least, could utilize this idea. This entry was posted in about writing, blog, novel and tagged art, artful, attention, awareness, creative, description, focus, heightened, imagery, Japan, liza dalby, Murasaki, scenery, skill, The tale of murasaki, writing. Bookmark the permalink. I, for one, enjoy descriptions of the people involved. I want to know what they look like. I also enjoy knowing what the scene looks like. But at some point, I do tire of description of places. I start to skim to get back to the plot. If you’re going to do a lot of description, you’d better have a strong plot. So, if the work is a fiction, I don’t want overload on description, and yes, I would definitely notice it. If it’s not fiction, then a lot of description is importion I guess. I agree with you that description should be kept to its necessity; and there are times when necessity demands the description of scenery. Sometimes description is used to enrich a character’s personality. A character moved by surrounding nature or the bustle of a city sidewalk must see it and react to it. As readers, would we have noticed unusually bountiful description in the book you told us about? I would have noticed and would have asked myself if it were necessary. I get impatient with too much description. In this case you pointed out that it served a purpose.